With this large capacity electric oven at 6.3 cu.ft. and True Convection cooking, you'll be able to handle all of your family's cooking needs with ease. Don't worry about the mess after - LG's innovative EasyClean technology makes clean up quick and easy in just 20 minutes. A shatter-resistant cooktop that withstands wear and tear and powerful cooking features mean that this four element electric range, available in fingerprint resistant stainless steel, is built tough for the long haul. The Precision Cooking system helps ensure each meal is cooked evenly, while high temp self clean works hard to remove the toughest baked-on foods. And with a 10-year limited parts warranty1* and the fact that this 5.3 cu. ft. freestanding range is designed, engineered and assembled in the U.S.A. with genuine American Pride, you can count on cooking up favorites for years to come. 6.3 cu. 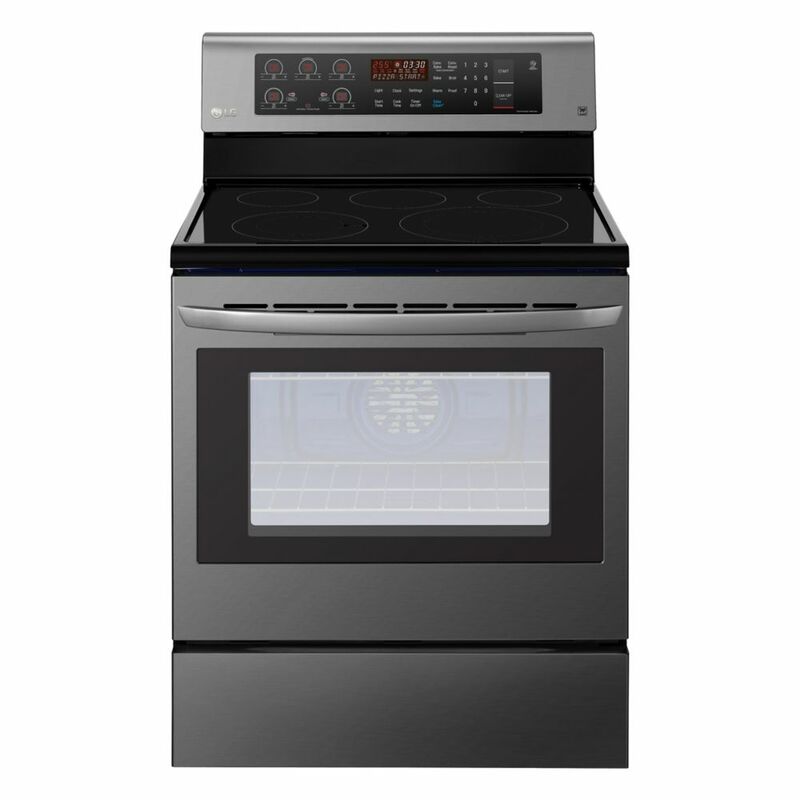 ft. Electric Range with EasyClean and True Convection in Black Stainless Steel With this large capacity electric oven at 6.3 cu.ft. and True Convection cooking, you'll be able to handle all of your family's cooking needs with ease. Don't worry about the mess after - LG's innovative EasyClean technology makes clean up quick and easy in just 20 minutes. 6.3 cu. ft. Electric Range with EasyClean and True Convection in Black Stainless Steel is rated 4.3 out of 5 by 262. Rated 1 out of 5 by Howie O from WORST PIECE OF JUNK EVER Electronics went out and it took nearly 2 weeks to get LG to replace the parts. Easy Clean Oven is a joke. It is not self cleaning. Water Clean doesn't work. Bought it at Lowes and they told us it was self cleaning. How do I turn the oven on? How do I unlock the oven door? I want to simmer broth for more than 12 hours. Is there a way to turn off the automatic shutoff? We are unable to find our manual. It's a GREAT oven, but I want to lock and clean for the holidays. It's in the manual, can you explain or can I download the manual? We have one of these and there are stains on the bottom the the easy clean feature does not get off. &nbsp;What products are safe to use and not permanently stain the blue paint in this oven. What color is the clock on this oven? I am ocd and have to have my clocks match. We are having problems during the convection bake to have both racks of cookie to cook evenly. Top rack position 4 overcooks and rack 2 is undercooked. When the oven is in convection bake will the convection element be be visible or red when it's on? Does &nbsp;the oven door lock! ?